CES 2013: Acer presents their budget Iconia B1-A71, AcerCloud and Windows 8 computers! Before CES happened Acer's B1-A71 spent a lot of time on the cameras, there was leak, after leak, after leak so we'll start with it's official reveal and then we'll look at Acer's new AcerCloud service for iOS and Android and if you're after one of Acer's new computers we have a link for you to follow to see the best of them! Now this particular device was not a very well kept secret, but that doesn't really matter in this day and age, one thing we did know was that this is a budget device and nothing has changed on that front. Acer has though confirmed some of the specifications; we will have Android's Jelly Bean operating system running on a dual-core 1.2GHz processor from Mediatek. You'll have 512MB of RAM, a WSVGA, that's 1024x600 pixel 7" screen , 8GB of internal storage and a single front-facing 0.3-megapixel camera. This is surprisingly a rather slick device it weights in at 11.3 ounces and it's only 11.3mm thick and those cool blue sides definitely make it look pretty good! There's no confirmed price yet, but Acer says it'll start at under $150 and we don't know exactly when it'll be ready for prime time! The full press release is embedded at the bottom of the page! Acer announce AcerCloud for Android and iOS! For those of you out there who own an Acer laptop you will probably have used Acer's online storage facility, AcerCloud. So far this service has only let you upload files from your computer, which you could then download onto a different device, you couldn't get your phone or tablet backed up through the service. That is all changing today because Acer just announced it's updating their service to support Android and iOS as well as Windows. Thankfully you won't have to buy extra storage to back those devices up, it'll just use up some of your allowance which came with your computer. Acer also added a useful new feature called, "Remote Files". This gives you the option to access anything on your Windows PC from your mobile device Android or iOS device and download it too. And finally, Acer also showed off PicStream which lets share photos across different devices and you can use AcerCloud Docs to do the same thing with Office documents. The update will be available at some point this month and you will have it installed on all of their consumer PCs by Q2! If you're interested in any of Acer's new computers and Windows tablets then head over to CNet for the full details! The Press release for AcerCloud is first followed by the one for the Acer B1-A71 below! Acer Extends AcerCloud to Top Three Operating Systems, Making it Easy to Share Files and Media Among Windows, iOS and Android DevicesLAS VEGAS, NV (Jan. 7, 2013) Acer today announced cross-platform support for AcerCloud, the company's file sharing and media management solution, free to Acer customers. Consumers can now share, retrieve and enjoy their multimedia and data files using a variety of computing devices, regardless of which operating system they are running – Windows, Android or iOS. AcerCloud uses the free space on a PC's hard drive as cloud storage space. Users simply designate one of their PCs as their "Cloud PC," enabling them to use the available hard drive space on their own PC, giving them security and full control over their storage needs. And unlike other cloud solutions, consumers won't receive constant reminders about exceeding capacity with solicitations to pay for more storage. "With AcerCloud, Acer now supports free file sharing between all of the key mobile devices, adding tremendous value to Acer customers," said Acer President, Jim Wong. "AcerCloud greatly simplifies our customers' ability to manage all of their digital assets across all of their devices, regardless of platform." Users can also use the new "Remote Files" application for direct access to any of their Windows PCs from any of their other devices. They can upload and download files on any Android, iOS, or Windows device, whether at home or on the road, using Wi-Fi or their cellular network service. A feature especially convenient for professionals, AcerCloud Docs enables users to push their Microsoft Office documents to any of their Windows, Android or iOS devices. For example, a document edited and saved on a PC will be pushed to AcerCloud and available for download and viewing from any of their other devices wirelessly and automatically. These files will be synced at AcerCloud and available for 30 days from the day files were modified. There is no limit to storage capacity. PicStream allows consumers to push all their photos to any of their Windows, Android or iOS devices at anytime, anywhere. They can take pictures with their smartphone or tablet, and view them instantly on any of their other devices. These pictures will be synced at AcerCloud and available for 30 days from the day the pictures were taken. Like documents, there are no limits for storage capacity. With AcerCloud clear.fi, consumers' multimedia libraries are available for managing and enjoying on any device; users can manage their pictures on their PCs and view them on their smartphones and tablets. In addition, a user's complete music library is available and can be streamed or downloaded and enjoyed on any device running Windows, Android or iOS, from any location. 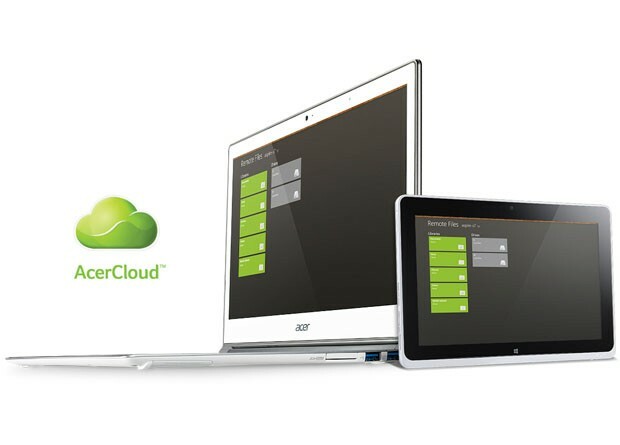 The new version of AcerCloud will be available for online update starting in January 2013, and will be bundled on all Acer consumer PCs starting in Q2 2013. 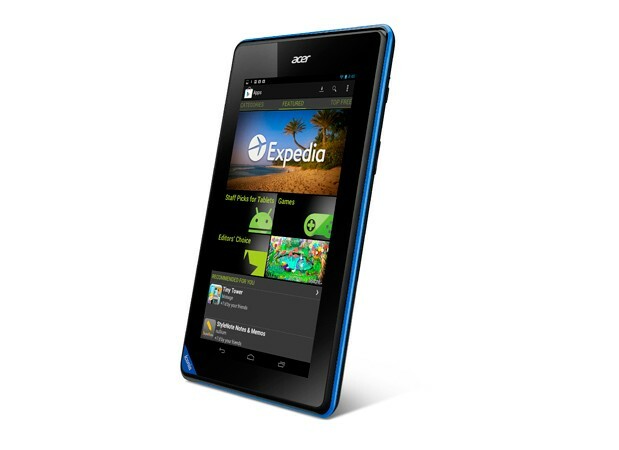 TAIPEI (Jan. 7, 2013) – Acer today announced the Iconia B1-A71 tablet targeted at young or new users or families looking for an additional tablet for their children. The Iconia B1 is also ideal for busy individuals seeking a convenient mobile companion. At 7 inches – the same size as a standard book page - the display is comfortable for e-reading, web browsing, playing games and watching videos. Super Portable: The Iconia B1 is easy to hold and use in one hand, a triangular corner grip on the lower left side improves single-hand usage even more. It's also easy to tote around in a bag or jacket at a feather-light 320 grams, making it one of the lightest 7-inch tablets in the market. The new Iconia B1 expands the Acer tablet family now offering three 10-inch Android, two 7-inch Android, one 11" Windows 8 and one 10-inch Windows 8 Hybrid Tablets.